Here, I offer you up the first in an ongoing series: my Cookbook Series. This time I’ve made something wonderful out of dark meat chicken pieces and a copious amount of Hungarian paprika. This recipe from the Williams-Sonoma collection struck my eye mostly because of the paprika. A few weeks ago I bought a tin of Hungarian paprika and I’ve been experimenting with it, trying to figure out what flavors I enjoy with it, and how best to use it. So, when I saw a recipe that featured the exact spice that I’d been playing with, I knew I had to give it a shot. And besides, anything with half a cup of heavy cream couldn’t be too bad! I tweaked the recipe, of course. I used less chicken and upped the stock, creating more sauce per serving (always a good thing, especially when you’re serving it over pasta). I also didn’t fuss with the tomato as much as the recipe called for (see below for more on that). You don’t have to use an orange beefsteak tomato for this dish; I used it because it was what I had on hand. Any good tasting tomato (or tomatoes, if they are smaller) would, I imagine, work fine. As would a can of diced tomatoes if that’s what you have handy. This is a hearty, warm, and delicious recipe. It is simple, but not one-note. The flavors all meld well together and I found that it was comforting as well as being a little different. It isn’t what I usually do with chicken and I think I like it for being something new as much as I do for it being tasty. Which, now that I think about it, is one of the reasons to delve into my cookbooks again! Put the chicken pieces in a container or zip-top bag and squeeze the juice from half the lemon over them. Season with salt and pepper. Let them sit while you chop the onion and tomato(es). In a large saute pan over med.-high, heat the butter and oil. Add the chicken and saute, turning every few minutes so that all the sides get nicely browned. Stir in the onion and continue to cook for a few minutes until the onion begins to soften. Add the paprika and cayenne pepper and mix until everything has turned a lovely reddish color. Add the stock and bring to a boil, scraping up any browned bits that may have stuck to the bottom of the pan. Reduce the heat so that your chicken is simmering in the stock, cover, and cook for 20 minutes, stirring occasionally. Meanwhile, cook the tomato in a small saucepan until a fair amount of its liquid has evaporated. Season with a little bit of salt, and stir frequently to break up the tomato. (The original recipe had you then forcing the tomato thru a sieve before adding it to the chicken mixture, but I deemed that step entirely unnecessary and left it out. If you care about not having tomato skins or seeds in your food, by all means sieve away!) Add the cooked tomato to the chicken pan, stir to combine, and cook another ten minutes. The chicken should be just about falling off the bone at this point. Take the chicken pieces out of the saute pan and keep warm. Add the cream to the sauce and stir to combine. Add the juice from the other half of the lemon and season to taste with salt and pepper. Your Paprika Chicken is done. Serve the chicken over your favorite short pasta shape and spoon the sauce over everything. If you like, add a lemon wedge to each plate. A note on the pasta: I bought this campanelle pasta because I’d never tried it before, it looked pretty and seemed like it would hold sauce in its nooks and crannies. I was pleased with it and also thought that the shape was fun to eat. 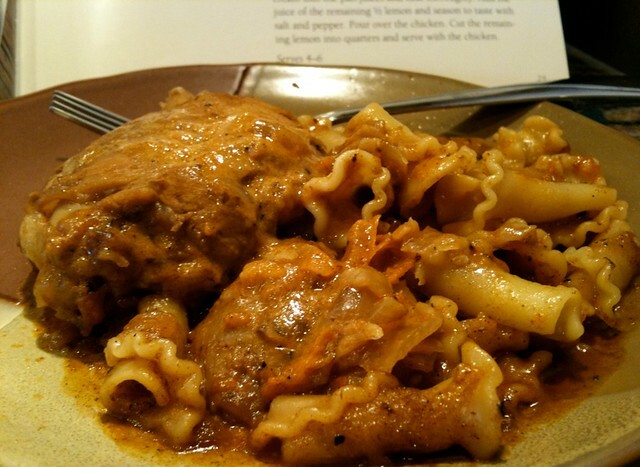 A note on left-overs: Serving five, this recipe provided me with lots of tasty left-overs. I put everything into a container and was pleased to discover that the pasta and sauce was even better on the second day. The pasta absorbed more of the sauce while in the fridge, and made for a delicious lunch. 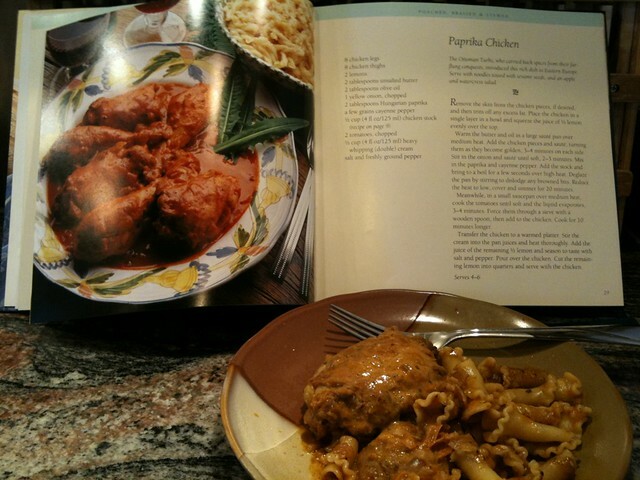 This entry was posted in Cookbook, Poultry and tagged chicken, cream, lemon, onion, paprika, tomato. Bookmark the permalink.